Is there a better alternative to Mechanic? Is Mechanic really the best app in Internet Utilities category? Will Mechanic work good on macOS 10.13.4? Mechanic is a utility to improve your post-download management of Transmission. Its runs in the menu bar and monitors Transmission. Mechanic can tweak your downloads once certain conditions are reached. Mechanic uses Transmissions built-in remote access. 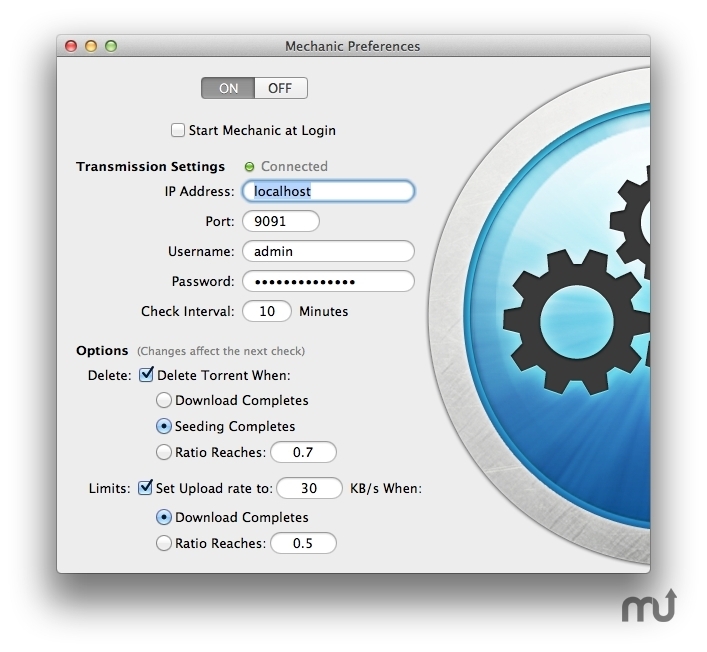 If Mechanic is running on a Mac with Transmission simply turn on the Remote Access in Transmission. Mechanic regularly monitors your transfers in Transmission, patiently waiting for the specified conditions to be met. Mechanic can remove a download when it completes or reaches a ratio. Mechanic can adjust the upload rate when it completes or reaches a ratio.